It’s not always easy to decide what beauty essentials to take with you on a short or long trip. Especially as nowadays there are a lot of restrictions on what you can take in your carry-on! Before I would just throw my toilet bag in my bag and I was ready to go. But now we really have to consider which toiletries we take with us, and if they meet the size requirements. 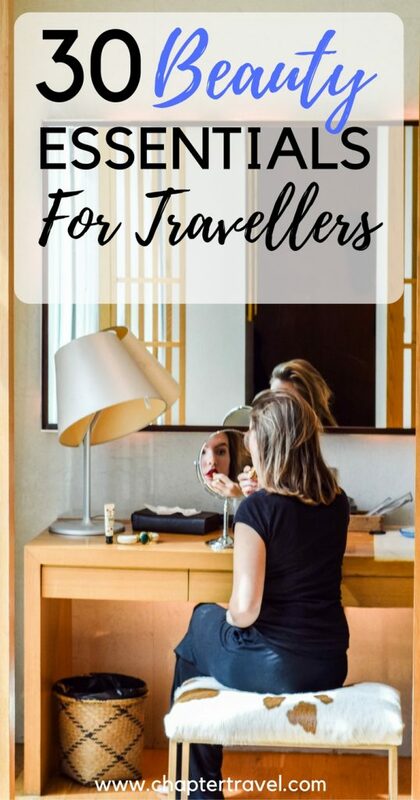 For this post I’ve selected some of the best beauty essentials for travellers to help you on your way. You’ll find products such as the necessary sun cream and shampoo, but also luxury products like eyeliner, beauty oils and more. All these beauty essentials either come in travel size or are in solid form! Ideal to treat yourself or to buy as a gift for another traveller. Get ready to shop some travel-ready beauty products! 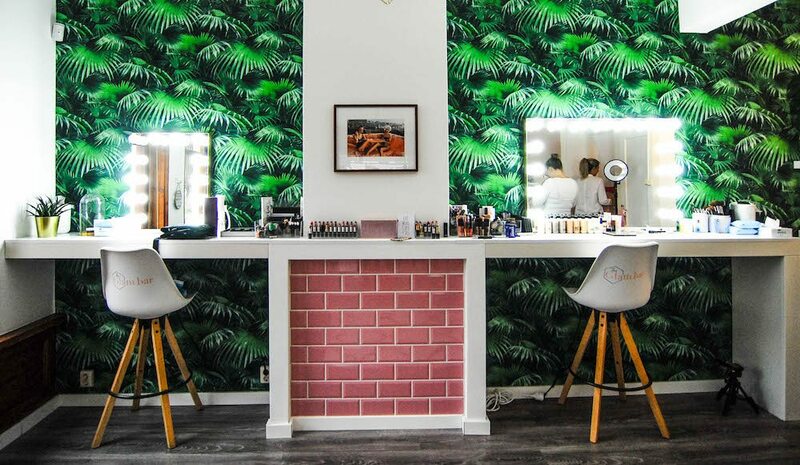 For those who were wondering, the featured photo above is taken at The Glambar in Rotterdam. Do you want to take your own beauty essentials with you, but aren’t they available in travel-ready sizes? Then make sure you get this cute Travel Smart bottle set. They meet the required sizes and are ideal to store shampoo, conditioner, body lotion, wash gel and more! These Yes to Tomatoes cleansing wipes are ideal to take with you when you’re travelling. No need for water! These wipes are 95% natural, oil-free and are not tested on animals. Cleansing wipes are a real essential for travellers, as you don’t always have the luxury of a running tap to clean your face. The Miracle Rose Cleansing Stick is perfect for travellers! It comes in a solid form, so there’s no reason to worry about having too much liquid products with you. It’s an excellent product too, with over 90% natural ingredients and a lovely floral sent. You’ll even find real rose petals in the stick! This cleansing stick is recommended for all skin types. It’s a bit ridiculous that this list includes a cleansing stick and a ball, but I just couldn’t choose. That’s why I just included both of them and you can decide which one to take on your travels (maybe both too?). When browsing the web you find a lot of amazing reviews about the Bosnia Charcoal Jelly Ball Cleanser. I personally haven’t tried it yet, but it does sound interesting. And, as it’s solid again, it’s an ideal beauty product for travellers. solid toner that came to the market. It’s super easy to use, as you just have to apply the stick directly to your face. This toner includes matcha green tea and organic cactus elixir. Perfect for purified pores and smooth, hydrated skin! business trips. It’s a bit more complex than the simple washing wipes and might not be possible for every type of traveller, as unfortunately not every traveller can charge gadgets everywhere they go. But if you do have the possibility to charge, consider this brush. It offers a deep cleansing for a beautiful skin and is easy to take along with you. The award-winning Kate Somerville ExfoliKate Intensive Exfoliating Treatment is the perfect facial scrub to take along with you in your carry-on. It exfoliates and polishes your skin, showing a smooth, healthy-looking, glowing complexion. Who says you can’t have a luxurious beauty routine when you’re travelling? Caudalie Polyphenol C15 Overnight Detox Oil is a 100% plant-based oil that helps to renew and protect your skin. It works during the night and makes sure that tired skin gets a detox. Just what you need after a long journey in the bus or after a busy day exploring. The hydrating Dermalogica Age Antioxidant Hydramist comes in a convenient travel size. The antioxidants are the perfect protection against free radicals. But even more important, it keeps you refreshed throughout the day! Ideal for all those hot temperatures. definitely do, so what about these Dove Go Dress Cool Moisture Body Wash with cucumber and green tea? It’s a refreshing body wash, which is perfect for exotic tropical destinations. It’s always a good idea to exfoliate you body if you spent a lot of time in the sun! This exfoliating body scrub for smooth skin by Clarins comes with Natural Bamboo Powders and casts off rough, flaky surface cells and impurities to give your skin a new start. Plus, it comes in a handy travel sized package! Be sure to keep your skin hydrated! Especially if you spent a lot of time in the sun. Besides having a great aftersun, a body lotion is also a must-have. What about Palmer’s coconut oil body lotion in a travel sized bottle? It smells delicious! this hand salve by Kiehls. The cream contains a mix of botanical oils and natural wax derived from Olive Oil. It’ll soothe, moisturize and condition the skin of your hands. So I don’t paint my nails when I travel, but if you do these nail polish remover pads by LA Colors are super handy. They come in 6 fruit scents, remove your polish instantly and leave your nails moisturised! This Pinch Minimergency kit is such a cute idea to give as a gift to travellers! In this Minimergency kit they’ve thought of everything. It includes items such as a deodorant swipe, Advil, nail polish remover pads, bandage, dental floss, emory board, double sided tape, hairspray, lipbalm, breath drops, stain remover wipe, a tampon and more. And all of this in a super small (and cute) pouch! Every item is mini, hence the name. Adorable! I wasn’t sure if you could bring tweezers with you in your carry-on, but after a bit of web searching I found that YOU CAN! These stainless steel, mini-size tweezers by Tweezerman are great to take with you. A solid deodorant is probably the safest choice for your carry-on luggage! This 2 pack by Dove are the perfect protection against sweaty armpits. If there isn’t always the certainty of a hot shower during your trip, a dry shampoo is a real essential to keep your hair in control. I also use this beauty product when I’m not travelling, it’s just very convenient when I don’t want to wash my hair but it’s already a bit greasy. The shampoo bars by Lush are so handy to take with you in your carry-on. It’s a solid form of shampoo and actually looks like a soap bar. When you rub the bar onto your hair it’ll foam up like with liquid shampoo. Not only is the solid form easy to take with you, they also last way longer than normal shampoo (up to 80 washes!). Protect your hair against the damaging effects of heat styling with the Moroccanoil Perfect Defense. It comes in a small package, perfect for in your carry-on! A leave-in conditioner is ideal for travellers, as it’s easy and moisturises your dry hair. This leave-in conditioner is also a way to prolong your styling, reduces frizz and leaves your hair silky smooth. This foldable hair brush is super compact and comes with a mirror. This is a perfect travel essential for travellers, as it’s the basis for your beauty regime. A normal brush will do, but of course it’s super convenient if it doesn’t take up a lot of space in your carry-on or backpack. This useful organic sun care travel set are ideal, as it contains every protection you need for the sun. The set includes a SPF 30 Face Cucumber Moisturizer, a Radical Recovery After Sun Lotion, a SPF 30 Pina Colada Sunscreen and a Liplux SPF 30. Yes, I really said Pina Colada, isn’t that an exotic sunscreen? With this travel-size set you’re all set for the sun! This Estee Lauder Sumptuous Knockout Defining Lift and Fan Mascara is great, and it even comes in a special smaller travel size. When I travel I barely wear any make-up (depends a bit on the destination though), but mascara is still a beauty essential for me. If there’s one make-up essential I would recommend to take with you on a trip, it’s a BB cream. It’s usually lightweight, covers imperfections and often contains SPF to protect your skin from the sun. Take this Bobbi Brown BB Cream with SPF 35. Besides covering up impurities, it also evens skin tone, moisturises, brightens dullness and over time it helps reduce the look of wrinkles. But of course the best part is the protection against damaging UVA/UVB rays! Of course you need toothpaste! Every toothpaste brand comes in a special travel size tube, like this one by Colgate. Luckily you can get toothpaste pretty much every where, so no need to worry if you don’t have one that fits in your carry-on. Another thing you need to have in your beauty essentials no matter what: a toothbrush. This foldable toothbrush is super handy when travelling. There’s a cap to keep the brush clean when you’re not using it! I keep coming back to the hanging toilet bag in my packing and gift guides. Because one thing I’ve noticed during our travels is that there isn’t always a place to put your toiletries. A hanging toilet bag is the way to go for all your beauty essentials on the road. That were the 30 beauty essentials for travellers that you can take with you in your carry-on! What beauty product do you always take along on a trip? Let us know in the comments! Cute! I definitely travel with most of these. Those shampoo bars look great! Great list! I can sure see my suitcase when I travel with at least 10 from your list! But really does depend on where I am going and what to bring.